Technology getting smarter on both sides, opening new options for chipmakers. The ability of unmanned aerial vehicles to fly legally over fences, walls and property lines is disrupting more than just the few industries that use drones commercially. As the drone market grows, so does the anti-drone market. The market for products that track, trap or break unmanned aerial vehicles (UAV) is growing alongside the market for drones, much of it driven by fear that UAVs could be weaponized by terrorists or used as platforms for corporate espionage. This is less far-fetched than it sounds. One tech industry executive told Semiconductor Engineering that he recently found a drone hovering outside his 45th-floor hotel room in Shanghai. He immediately closed his laptop computer. Still, there is widespread confusion about what is legal and where, who owns the air space above private property, and how privacy laws apply. And what is legal in one country may not be legal in another. This is a problem that gets worse as more drones are manufactured, and right now the market for UAVs is booming. A 2016 U.S. Federal Aviation Administration (FAA) report predicts unit sales will more than double to 7 million by 2020, up from 2.5 million in 2016. Revenue from those sales will rise from $4.4 billion in 2017 to $13.1 billion per year by 2027, with sales of commercial drones surpassing spending on consumer drones by 2024. Moreover, that trend is expected to continue accelerating, according to recent report from Teal Group. Chinese drone-maker Dji Technology holds about 72% of the global civilian UAV market, according to a 2017 market-share survey from Skylogic Research. But this is a market where the technology also has matured over the past few years. What was once a thriving opportunity for an estimated 100 semiconductor startups and chipmakers is now down to less than a dozen competitors, with most of the innovation occurring in the imaging and the overall security rather than the SoC itself. This meshes with data from a different emerging trend, namely how to stop UASes. The counter-UAS market is projected to grow 19.9% to $1.2 billion by 2020, up from $214.7 million in 2016, according to Transparency Market Research. The anti-drone products that get all the attention—large-scale lasers and microwave emitters, jammers to cut off drone links to remote controls or GPS systems, projectors designed to take over control of flying drones, and the long list of kinetic responses designed to damage or destroy drones flying where they’re not wanted—are all pretty much illegal except to a small number of law enforcement agencies, according to Michael Blades, technology and research director for Aerospace, Defense & Security North America for Frost & Sullivan. Although being able to stop a drone that is clearly bent on some criminal purpose is important, it is much more important for most companies to recognize drones as one more item in a long list of security threats they already track, according to Pablo Estrada, vice president of marketing for enterprise drone-monitoring firm Dedrone. 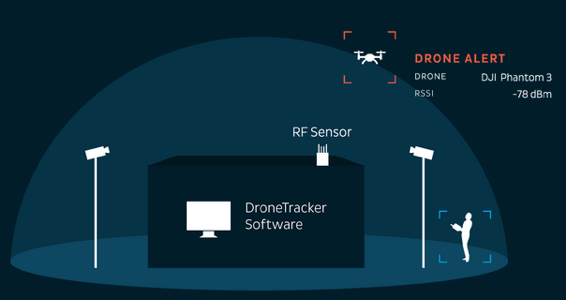 Dedrone offers direct-mitigation products, but its focus is detection systems that use acoustic, RF, GPS and other sensors to discover drones in the area, triangulate the location of both drone and pilot, and create a record of activity with profiles of local drones so customers can tell when the appearance of an unfamiliar drone is anomalous enough to be considered a threat. 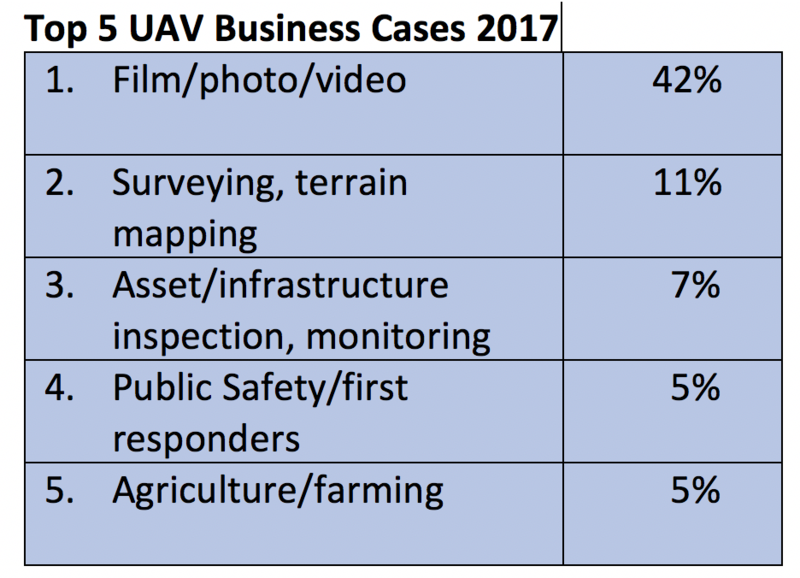 That’s a common approach for companies developing commercial drone businesses, which recognize that having drones over the property could be a security issue just as having pedestrians with cameras on the property might be, according to Lisa Ellman, a Washington D.C. attorney and co-executive director of the Commercial Drone Alliance. Dedrone recommends that customers install the systems they need to monitor drone activity effectively and then keep track of the patterns to learn what is a normal pattern of drone flight and what isn’t. Drones that land on the property are trespassing, so physical security can deal with them; drones that act as entry points for hackers can be countered by shutting off certain types of access to systems nearby. In that way drone-based cyberattacks may actually be more obvious than spear-phishing or other, more stealthy approaches. Above a certain height in the United States, the airspace is public property, so it’s not possible to prevent all drone overflights. But it is possible to keep them from seeing anything important by being aware of when and how a drone or a person with a camera-phone might be in a position to take pictures of something. Covering up is a perfectly reasonable solution, as is being aware of when visitors or innovative designs or other things that could be considered important secrets might be exposed to public view, according to Colin Snow, CEO and founder of Skylogic Research, whose data comes from detailed surveys of drone users. The problem is that it is much more difficult than it should be to identify specific drones and figure out if they pose a threat. “Right now, if you see a drone where it’s not supposed to be, you can’t tell if it’s a threat or a haphazard route flown by someone who probably doesn’t know where they are or aren’t supposed to fly,” Snow said. Without the ability to identify a drone without examining it physically every other aspect of drone security, the administration of drone-based businesses and enforcement of flight rules, privacy and property rights all are far more difficult, Snow said. The U.S. Federal Aviation Administration (FAA) is lobbying Congress for permission to require broadcast drone identification as part of its upcoming reauthorization act, but that legislation is packed with other changes, including an omnibus public/private approach to developing systems to create the equivalent of air traffic control for drones, and requests from the Dept. of Homeland Security and Dept. of Justice for permission to block, shoot down or confiscate a drone they consider a threat. The rules have already mired the FAA in fights with hobbyists protected by language in a previous FAA authorization bill from any attempt by the FAA to regulate them, and from civil rights groups including the Electronic Freedom Foundation (EFF), which considers giving law enforcement blanket permission to shoot down drones a danger to civil and property rights. Journalists have the right to fly drones in reporting stories as part of the freedom of the press, codified in Congress’s 2012 FAA reauthorization act. Amazon, Boeing, GE and Google are working with the FAA on tests of the Low Altitude Authorization and Notification Capability system, which is a first step in development of an overall Unmanned Aircraft System (UAS) Traffic Management (UTM) system. Intel’s Drone Group also is participating in one of the 10 Integration Pilot Program (IPP) programs to demonstrate implementations of Intel’s Open Drone ID specification for drone ID in obstacle-avoidance and weather systems. The UTM and IPP test programs are part of the FAA’s concerted effort to build the infrastructure necessary to allow commercial drone traffic on a large scale while keeping the national airspace controlled and safe, rather than simply giving some industries exemptions from the rules, as it does currently. That allows much more commercial activity, which encourages growth in industries that make drones, anti-drone systems and the semiconductors on which they both rely. “We see a number of areas growing strongly in the use of drones for commercial purposes, but the ones that are really going to take off are the areas that involve inspection,” according to Philip Finnegan, director of corporate analysis at Teal Group. Inspections already are happening in the telecom industry to reduce tower climbs, thanks in part to the FAA’s Part 107 license that no longer makes it necessary for drone operators to have an aircraft pilot’s license. The drone operators have to pass a test to get their certificate. Regulations restrict flight to under 300 feet and never over people or out of the line of sight. A human pilot must always be in control of the drone, so the use of automated flight paths, while possible, is limited. “Construction, oil, gas, mining, insurance all are poised to grow, but use of commercial drones will grow faster with greater autonomy and the ability of one person to operate multiple UASes, which the FAA doesn’t allow right now except possibly under exemption,” Finnegan said. Drones are ubiquitous in the real-estate and construction markets, as well. They save time, money and effort for companies inspecting industrial job sites, inspecting buildings, oil derricks and utility facilities. Drones are a classic case of technology outpacing regulations. That will likely change over the next decade or so, as more complaints are filed by people and companies around the globe and then litigated in the courts. At the moment, though, the commoditization of the technology and the rapid development of counter-technology will fuel both opportunity and confusion, and the semiconductor industry will likely benefit from all of it. The global anti-drone market was valued at USD 393.4 million in 2017 and is anticipated to grow at a CAGR of 26.9% during the forecast period. 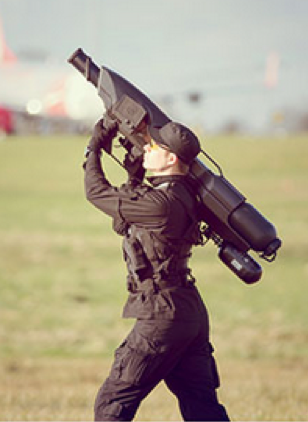 Anti-drone is developed for neutralization and disruption of unmanned aerial vehicles or unmanned aircraft systems in remote or urban areas engaged in hostile airborne surveillance, terrorist attacks, and other malicious activities. Anti-drones systems remotely detect, track, and classify UAVs prior to disrupting their operation. Anti-drone systems offer protection of areas such as private houses, government buildings, border security, airports, military facilities, commercial locations, and critical infrastructure among others. Anti-drone solutions include UAV detection equipment such as acoustic sensors, drone detection radars, RF spectrum analysers, and video surveillance systems; drone neutralization equipment such as jammers, counter-drone lasers, drone capture nets, and interception systems; and other security solutions such as long range acoustic devices, video acquisition and distribution systems, security-related software, and others. The increasing security breaches by unidentified drones primarily drive the growth of this market. The rising incidences of terrorist activities coupled with increased need to provide security to citizens also supports market growth. Increasing government Initiatives for protection against cross border disputes and civil wars accelerates the adoption of anti-drone systems. Additionally, increasing cases of smuggling and trafficking with the help of drones, further encourages the use of anti-drones. Other factors driving the growth of this market include technological advancement, and increasing investment in R&D. However, high initial cost limits the growth of the market. A drone, in technological terms, is an unmanned aircraft. Drones are more formally known as unmanned aerial vehicles (UAVs) or unmanned aircraft systems (UASes). Essentially, a drone is a flying robot that can be remotely controlled or fly autonomously through software-controlled flight plans in their embedded systems working in conjunction with onboard sensors and GPS. This has emerged in civil engineering industries rapidly.